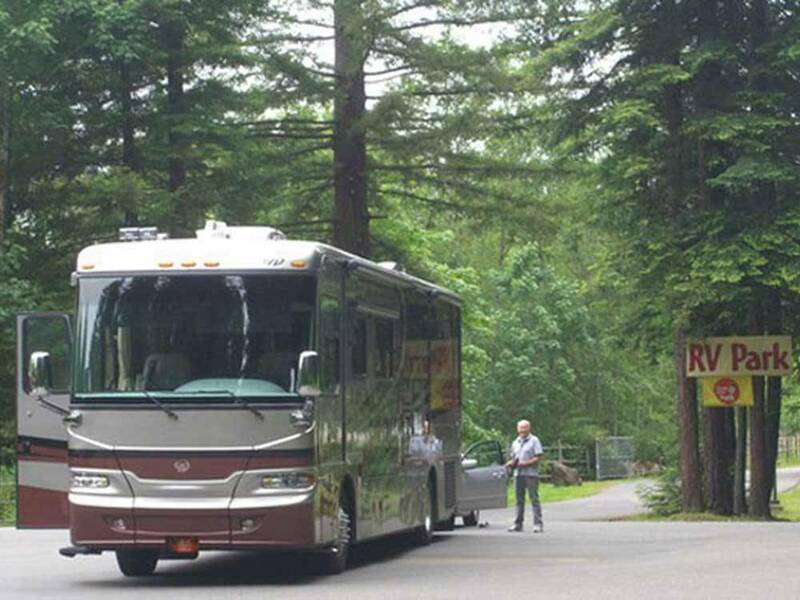 Situated on the Avenue of the Giants, this park is a beautiful forest getaway. The park itself is fairly small but has nicely paved and level sites (mostly pull thru's). Since you are in the middle of a remote forest, don't expect great (or any) cell service. Verizon was a no go. Tip: Turn on wifi calling to be able to make calls. The wifi is not free. You receive vouchers for internet when you check in and have the option to pay for more with the service provider there after. For basic browsing and email checks it was fine but streaming or downloading will use up your allotted data fast. Purchasing more internet was inexpensive so it wasn't a huge deal. It was very fast, though, unlike other parks with free wifi that are spotty or sluggish. Also, no cable or antennae stations came through. The bathrooms were clean. There were nice grassy spots next to the sites with plastic tables (no chairs, though, not sure why no picnic tables). Beautiful place! Owners were very friendly and helpful! Wife and I stayed 10 days, park is small but very comfortable, the staff was top notch and very knowledgeable of area. Would definitely stay again. What a find. The surroundings are excellent, large spaces with plenty of grass, and the people are way above average. This is on our list of return destinations. This was a well maintained park with paved roads throughout the park. The sites were level and easy to access. The park management basically says to pick a spot and does not assign camping spaces. This was good in that we were able to pick a site that was pleasing to us. The park has newer trees so is generally very sunny. We did enjoy our time there and would visit again if we were in the area. 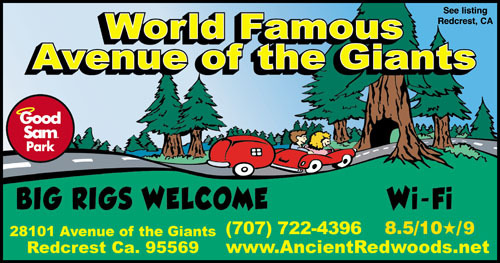 This site is right in the middle of the redwood forest and is located on the Avenue of Giants. We loved this location. If you have a bike, like to walk, enjoy drives through some of the most spectacular forests imaginable, this place is for you. It's truly a spectacular location. As for the RV park, we liked it quite a bit. The manager was so nice and let us pick our own site. The sites are fairly level, have grass on either side and some young trees in between. It's not very private in between sites and feels like you're parking in a parking lot. That is a small issue and didn't bother us. The lots are easy to get into and many are pull-thru's. The restrooms and laundry facilities were clean and in good repair. The hookups were easy to use and clean. The pressure of the water wasn't super strong but it met our needs. They're very dog-friendly and let us bring our 3 large dogs. Our dogs were in heaven as were we. There were a few families at this site. It's very safe and they seemed to really enjoy riding their bikes around the park. One of the kids showed us where the best blackberries were and we picked fresh berries and used them a few minutes later to make blackberry pancakes. The town of Miranda is a short, beautiful drive away. The gas station there offers diesel and they have a wonderful little market with some delicious, interesting foods. The drive alone makes it worth it. There are some cool, quirky towns and attractions along the way. We will absolutely come back here. If you just walk outside the front entrance you're in the most awe-inspiring location. We couldn't get enough of it and wished we could have stayed longer. This was a good park in a great location.